The premiere of Vondel’s Gijsbrecht van Aemstel in the Amsterdam City Theatre on Tuesday 25 June 1912 – the opening evening of the Dutch Music Festival – was an important event. For director Willem Royaards (1867-1929) and his theatre company N.V. Het Tooneel the new stage setting was a prestigious project. With scenery and costumes by Frits Lensvelt (1886-1945) and Nell Bronger (1878-1935) – the artist couple that was to become closely connected with Royaards’ productions – a simple, stylised mise en scène was created that broke with tradition. The incidental music that Royaards had commissioned Diepenbrock to write for this occasion, was performed by a vocal ensemble consisting of renowned soloists and the Concertgebouw Orchestra, conducted by Willem Mengelberg. The renewed interest in Vondel in the last quarter of the nineteenth century had led to, among others, the publication of two new editions of the Gijsbrecht van Aemstel, Vondel’s famous tragedy about the city of Amsterdam, modelled on Vergil’s Aeneid: one by Albert Verwey (1865-1937) in 1893 and the other a deluxe edition by De Erven F. Bohn in Haarlem in 1901. Shortly before the turn of the century the way of performing his works, which on the whole had remained realistic – despite the Vondel renaissance –, came under much debate when theatre reforms abroad also struck a chord in the Netherlands. Especially the internationally orientated weekly De Kroniek, which was founded in 1895 and to which Diepenbrock contributed for several years, adopted a critical stance on this topic. The production of 1912 was the second joint project of Royaards and Diepenbrock (see RC 101). They had both been acquainted with Vondel’s work since their childhood. Diepenbrock had already become familiar with the Gijsbrecht at an early age, as he had regularly heard parts of it being declaimed at his parental home. In September 1892 his fondness of Vondel’s tragedy inspired him to set the Rey van burchtsaeten (Choral Song of the Burghers, RC 28) for mixed choir a cappella. Then in 1893-1895 he also composed the Rey van clarissen (Choral Song of the Poor Clares, RC 30) and the Rey van Amsterdamsche maegden (Choral Song of the Amsterdam Virgins, RC 31) for female choir and orchestra, and the Rey van edelingen (Choral Song of the Noblemen, RC 33) for mixed choir and orchestra. The director thus explained his intentions in a letter to Antoon Derkinderen (1859-1925) ten days before the premiere of 1912, mentioning what he had learnt from listening to Diepenbrock’s separate choral songs. When Diepenbrock was working on compositions back in ’s-Hertogenbosch, he had close contact with this painter. Like the individual Reyen, the incidental music for Gijsbrecht van Aemstel is dedicated to Derkinderen. The three chorals songs with orchestral accompaniment had already undergone several revisions, each time in an attempt to make the orchestration more adequate.1 Nevertheless, when in mid-December 1911 Royaards put his request – through his wife Jacqueline – to Diepenbrock, the composer did not mind. (BD VII:297). Already on New Year’s Day 1912 Elisabeth Diepenbrock wrote in her diary: “Fons is enthusiastically making a set-up for his Choral Songs for 3 quartets and small orchestra; it has always been the intention that they are to be performed [...].” (BD VII:310) So, despite some initial hesitation based on Royaards’ suggestion to use an ensemble of only seven singers, Diepenbrock almost immediately decided to make a virtue of necessity, the challenge being that he had to rewrite his music for a choir of soloists and 24 musicians, a ‘Bach orchestra’. (BD VII:315) Soon he realised that the new adaptation was very much in line with the series of revisions he had made the previous year of other works, including Im grossen Schweigen (In the Great Silence, RC 67). Now a fortunate suggestion by Royaards has prompted me to also rework the choral songs in the same way. I have been busy with it since 9 Jan. […] and I have almost finished the sketches of the first 2 Choral Songs. You have no idea how much it fascinates me to bring that music, which I made with so much passion and which remains dead in the scores, to life now. It is the fifth score I am making of the Choral Songs […] and only now will I fully realise it. Diepenbrock explained that the revision was not only about technique though (even in the last score – the fourth – from 1901 he considered the music still too much concealed by details and the far too compact and compressed structure of the composition ), but also about his sound ideal that had changed over the years. Therefore he not only revised the vocal setting, adapting it to a small ensemble, but also the orchestration. In order to achieve a more transparent sound, he left out the clarinets (except the bass clarinet), bassoons and horns. With this reference to Homer and Vergil, Diepenbrock, as a classical scholar, demonstrated that he considered Vondel’s tragedy a modern equivalent of the classical tragedy. He gave the prologue a motto from Vergil’s Aeneid (book 2, verse 324), which he notated in the autograph score: Venit summa dies et ineluctabile tempus (The last day has come and the unavoidable hour). 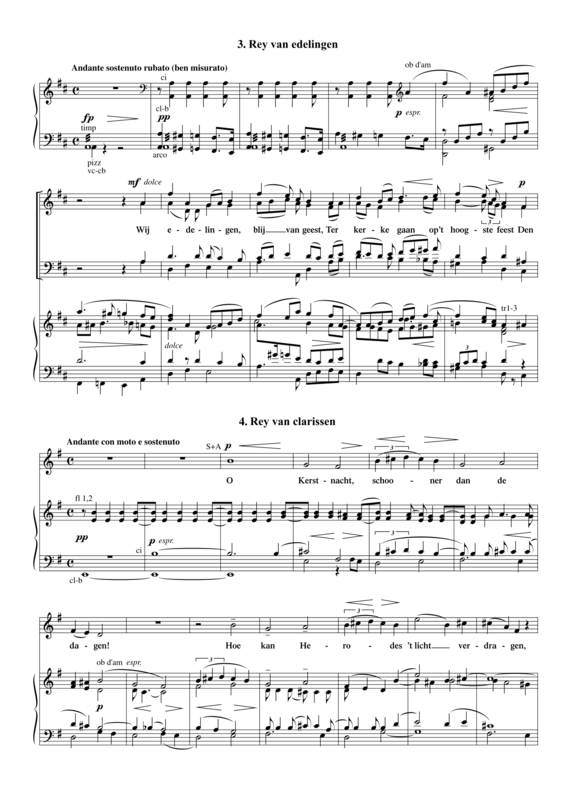 Simeon’s lofzang (fourth act) was added to the score as well in 1912. It is the prayer of the Poor Clares and the old bishop Gozewijn – now that they will no doubt be killed by the onrushing enemy – to “depart in peace", as Simeon put it in former times in the temple after having seeing the Christ Child (Luke 2:29-32). Diepenbrock composed this part as a solo for baritone and unison female choir on Thursday evening 25 and Friday evening 26 January. The appearance of the archangel is announced by the main theme from the Rey van edelingen, which stands out through the ascending major sixth, in the full orchestra. In that choral song this stately theme (maestoso) represents the trust in God’s providence of the faithful, who, still unaware of the pending danger, head off to church to welcome the first-born Redeemer. In the finale Diepenbrock also uses the opening of the Gregorian Te Deum, thus accentuating the special meaning of Raphael’s message of salvation. A last reference to the fate theme from the Prologue, which is drowned out by triumphant fanfare motives in the trumpets, is followed – Maestoso, energico – by the apotheosis in C major. The problems with the melodrama sections that had occurred in 1910 during the performances of Marsyas, of De betooverde bron (Marsyas, or The Enchanted Spring, RC 101), were due to the score not being clear as to where exactly the words should be spoken. Back then this resulted in a lack of coherence between the declamation of the text and the music. Although in the Gijsbrecht score the rhythm of the spoken text is also undefined, for the melodrama in the final part of this incidental music Diepenbrock did aim to achieve exact synchronisation of the spoken text and the music, as we can see from the regular division of the text over the pages of the score and piano score. In 1915, for the performance of the melodrama of Raphael, he defined where every syllable should sound by means of a rhythmic notation in piano score B-1(8). 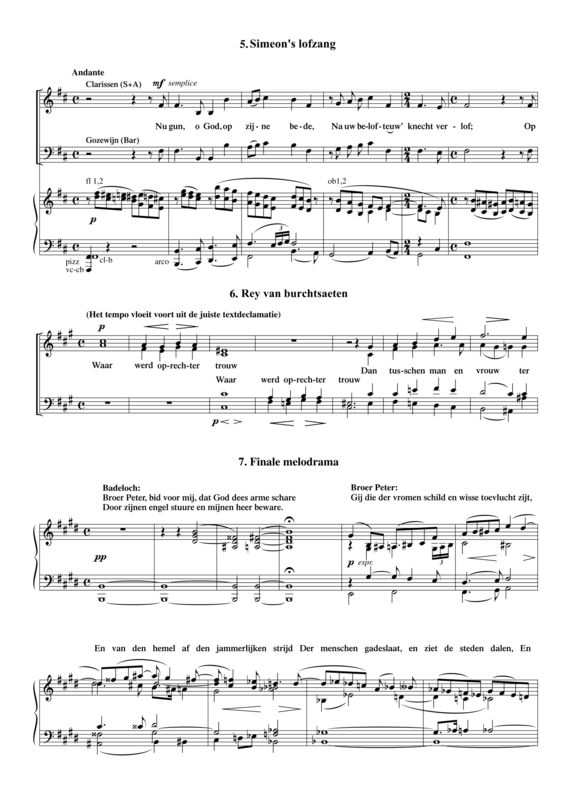 This document – the only time the composer recorded such a fixed rhythm of the speaking voice – was made at the request of the singer Jacoba Repelaer van Driel (1884-1967), who was to perform the role of the archangel in the Gijsbrecht production of 13 April that year. This new series of performances caused a long polemic, after fierce criticism, mainly from literary circles, focussing on Diepenbrock’s sung choral songs. The majority of these criticasters not only found that this type of performance affected the intelligibility of the text, they were also principally opposed to music of any kind in Vondel’s tragedies. Thus, an old discussion was reopened. The performance practice of Gijsbrecht van Aemstel was already a major topic in the first year of publication of the De Kroniek (January 1895); the music for the tragedy (in this case the incidental music by Bernard Zweers, see RC 30) was also criticised. At the instigation of Diepenbrock (BD VIII:134-137), Balthazar Verhagen published an extensive article in the magazine De Amsterdammer in April 1913 (BD VIII:627-633) to refute the negative criticism on the use of Diepenbrock’s music in the performances, claiming that Vondel did want his choral songs to be sung, as the poet apparently spoke of a musical piece of choral songs, practiced by a great Orlando , meaning a composer of the calibre of Orlando di Lasso. When in November 1914, after a reprise of the production, once again negative criticism was published, Diepenbrock felt obliged to give a public reaction himself and wrote an article to the editor entitled ‘De Reyen van Gysbrecht, Pro domo mea’. (BD VIII:698-703). After Diepenbrock’s death, Royaards never performed the Gijsbrecht van Aemstel with his music again. The production of the Gijsbrecht on New Year’s Day 1931 by director (and lead character) Louis Saalborn (1891-1957), based on Royaards’ concept and once again with Diepenbrock’s incidental music, was an homage to the two artists who by then had both died. 1 The last revision dates from 1901. See T. Braas, ‘Ik heb nu eindelijk het orchestreeren zoowat geleerd. Ontwikkeling van de instrumentatie bij Alphons Diepenbrock’, in: ed. A. Annegarn/L.P. Grijp/P. Op de Coul, Harmonie en Perspectief. Zevenendertig bijdragen van Utrechtse musicologen voor Eduard Reeser (Deventer: Sub rosa 1988), 46-61. 2 Theo Bouwmeester (1850-1930) was a famous actress in the Netherlands in those days. 3 Top Naeff, Dramatische Kroniek II (1918-1919), 113. 25 jun 1912: Het door de Maatschappij tot bevordering der Toonkunst georganiseerde Nederlandsche Muziekfeest wordt geopend met een voorstelling van Vondels Gysbreght van Aemstel in de Stadsschouwburg te Amsterdam door de N.V. Het Tooneel (dir. Willem Royaards) met medewerking van het Concertgebouw-Orkest en een vocaal ensemble, bestaande uit de dames Aaltje Noordewier-Reddingius, Alida Loman, Dora Zweers-de Louw, A. Kubbinga-Burg, Jo van de Linde, Pauline de Haan-Manifarges, A. Schierbeek, H. Scholten, N. Horst, A. Broms en de heren L. Meylinck, J.H. Gerhardts, J. van Kempen, R. van Schaik, J. Caro, H. Kubbinga, H.C. van Oort, G. Zalsman en Th. Denys, het geheel onder leiding van Willem Mengelberg. Een belangwekkende avond – en niet enkel omdat hij de plechtige inwijding van het Muziekfeest was, moge allereerst over den muzikalen factor hier iets meegedeeld. Muzikale elementen waren er stellig ook in de voordrachten der verzen, maar wij zetten graag de muziek in haar eigen aard, de vokale en instrumentale, op den voorgrond, als iets nieuws, als iets bijzonders, niet zonder spanning verwacht. — Wij wisten van Gysbreght-muziek van Zweers, en van Gysbreght-muziek van Diepenbrock, maar uitsluitend in de Concertzaal had eerstgenoemde, volledig, laatstgenoemde, fragmentarisch, geklonken: nimmer voor of tusschen een Vondelvertooning. — Was 't niet op het Nederlandsch Muziekfeest van 1902, dat Zweers' Voorspelen en Reien zijn uitgevoerd! Ook in de Naardensche kerk, niet waar, en in de muziekzaal van menige grootere stad. Zeldzamer waagde men zich aan Diepenbrock's Reizangen; nog wèl herinner ik mij de uitvoering dezer compositie, van drie der vier zangen ten minste, te Haarlem in '98: het was de eerste maal, dat zijn Gysbreght-liederen gezongen werden, wat den dirigent Robert tot eer is na te houden, al bleek zijn streven niet volkomen bekroond, en toen reeds de indruk gewekt dat die Reien 't allerbest aan een klein koor van buitengewoon begaafde zangeressen en zangers, met een uitmuntend orkest, zouden zijn toevertrouwd. Welke indruk werd bevestigd, toen wij te Leiden onder D.de Lange, de tweede en de vierde zang, te Rotterdam onder G.Rijken de eerste en de tweede gehoord hadden. — Nadien vernam men van dit Diepenbrock-werk niets meer, tot het nù, in volledigheid en schittering van klank tot ons kwam, schitterender en grooter ook dan wij tevoren ons droomden, èn in het milieu waarvoor het geschreven werd, – waaruit het ontstond. [...]. Deze partituur der Reien, een der eersten van Diepenbrock, is later afzonderlijk uitgegeven; en hij heeft er, aldoor zoekend en partijtrekkend van de ondervinding der schaarsche uitvoeringen in de concertzalen, telkens weer in gewijzigd; hetgeen uit een vergelijken van wat wij gisteravond hoorden, in de Rey der Klarissen en in die der Edelingen, 't meest wellicht in den eersten Triomfzang, duidelijk werd. — Tegen de nadering van dezen feestelijke avond evenwel heeft hij meer gedaan. Grooter vertelde ik, is zijn partituur geworden: verrijkt met een instrumentaal Voorspel, met een “melodrama” aan het eind, en met een instrumentatie van het lied der nonnen en vader Gozewijn. Zoo is zijn Gysbreght-muziek volledig geworden, en toch beknopter dan de, in verhouding tot de tooneelmatige vertooning, veel te uitvoerige van Bernard Zweers, die daardoor zijn eigen weg naar den schouwburg heeft bezwaard. Heeft Diepenbrock voor zich dien weg ook niet bemoeilijkt? In zoover wel, dat zijn Gysbreght-muziek verlangt – waar ik al op doelde – de samenwerking van een eersterangskoor met een eersterangsorkest. — Maar heeft men die eenmaal ter beschikking – wie zou dan nog twijfelen of muziek bij een Vondel-avond, als dien wij beleefden passend is? Vragen de Reien zelf er niet om? In wezen, in maat en klank verschillend? De een helder en blijd, blijd in den toon der verlossing, die met de vreugde om “het feest van Gods geboorte” samensmelt; de tweede minder juichend, eer weemoedig, vooral geloovig, sterk-geloovig, en teeder. Dan de derde, die der klaagtonen, het vreeslijke, gruwbaar komende doende voorgevoelen; zang ook van moederlijk mededoogen, vol bittere droefenis. Ten laatste, na de Amsterdamsche Maegden, de Edelingen, en de Klarissen, de Burchtsaeten, die de echtelijke liefde bezingen en hare voortreflijkheid. In al die zangen, ongelijk bedoeld wel is waar, hoort men taalmuziek en een uitstorting van het gemoed welke de gevoeligheid der zangkunst en de schildering van het instrumentaal penseel zoo wèl verdragen, wanneer voor Vondel een kunstenaar zich plaatst, die de macht en smijdigheid van diens taal, de klaarheid van zijn beelden, de vroomheid van zijn innerlijk voelt en haar in muziek kunstvol om te zetten weet. — Dit verstond Diepenbrock te doen! Hij heeft Gysbreght in een lijst van edele muziek ons getoond. Het Voorspel immers was een sober en fijn karakterbeeld, dat in de kleurige strengeling van het instrumenten-spel de motieven van het treurspel zelf ons even te verstaan gaf, en toch dóórdringend genoeg om de herinnering eraan te doen vasthouden tot ze in het Naspel (het Melodrama) ons schenen weer te keeren en anders belicht ineen te vloeien met motieven van de Reizangen zelf. Zoo werd heel de Rafael-scène omlijst door de in forsche beweging oprijzende melodie van “vergeestelijkte blijdschap”, welke uit de Rei van Edelingen ons eigen geworden was. De muziek droeg, voor mijn gevoel althans, in waarheid den zin van Vondel's poëzie, droeg voort en verlevendigde dien, en er waren vele oogenblikken waarin zij de innige belangstelling had, die men niet voortdurend aan Vondel's taal wijden kon. — Bega ik schennis aan den treurspel-geest, aan heel het Gysbreght-geval, door te bekennen dat de toonkunstenaar mij hooger hief dan ontelbare verzen? — Er spelen voor ons andere luyden dan voor Vondel's publiek! Men verwachte van Diepenbrock geen antiquiteiten-nabootsing. Immer zich zelf, zoon van onzen tijd: meester in het chroma, in licht-bewegelijke modulaties. 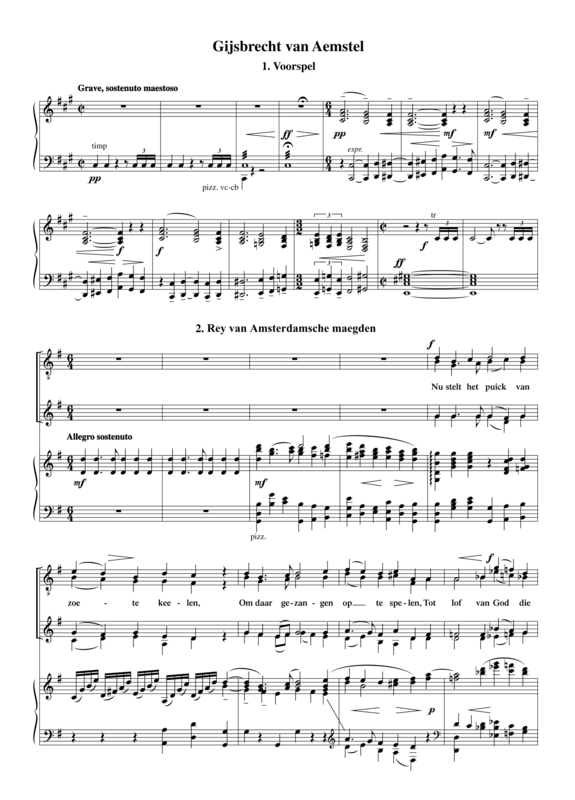 En deze prachtige eigenschap zijner partituren maakt ze op 't eerste hooren niet voor ieder licht verstaanbaar. Men voelt zich door de op zich zelf consequente stemvoeringen en de zelfstandigheid der instrumentale behandeling voorloopig wat onthutst, maar gaat men den melodischen gang volgen, dan ontwaakt het gevoel voor den melodische rijkdom die uit de harmonische combinaties opbloeit. — Zoo hebben wij genoten alle vier Reizangen, door een keur van Nederlandsche zangeressen (tien) en zangers (negen) gezongen, met de heerlijkste orkest-begeleiding die men zich denken kan; want zij was zoo schoon en voornaam van klank, zoo zuiver in de schakeeringen, zoo energisch waar 't móest.... Denk aan den inzet, der eerste Rei al. En met prachtige verbreedingen, ingehouden hartstochtelijk en warm; met de bekoorlijkste zangerigheid der solo-viool of violoncel of fluiten of harp. Zoo subtiel en doorzichtig.... — Maakte het zang-ensemble niet overal den indruk van klaarheid, aan de schrijfwijs ware toch 't te wijten eer dan aan de voortreffelijke stemmen die zich vereenigd hadden. De Rei der Edelingen, die, na de eerste voor vrouwenstemmen, door het gemengd koor wordt aangeheven, mist, meent men, die eigenschap van klaarheid, en heeft door haar lengte een opkomende bedenking tegen eenvormigheid te overwinnen. Hier was Vondel voor den toondichter wellicht 't minst sterk inspireerend. Hoe teeder zongen bij de woorden “O kind, gij zijt gelijk uw moeder”, de vier solo-stemmen zonder begeleiding: een oogenblik van tot ieder sprekend muzikaal gevoel. — Ontroeren deed de Kerstnacht-zang voor vrouwenstemmen alleen: wat waren we hiermee vèr van de melodie uit den ouden tijd, simpel in vergelijking met deze weelde van edel gedragen, expressieven zang, edel als de dichttaal die werd vertolkt! Technisch alles volkomen àf in de voordracht, en bovenal bewonderenswaardig die van de vierde Rei, a cappella, niet zoozeer met spontaan zich uitend sentiment dan wel met zinrijk overleg: door Diepenbrock bedacht en geconcipieerd. De oprechte trouw kan niet kunst-rijker, nauwelijks feilloozer bezongen. Het slepend klagen der tortelduif in de vier solo-stemmen schonk een zeldzaam kunststuk, waar slechts het dieper gevoel onder de langdurende triolen-beweging wat schuil ging. — En dit was de groote vreugde bij het luisteren naar den muzikalen Gysbreght: dat het zwevend, elastisch-zangerig moevement der Reizangen, het dramatisch en dichterlijk schilderende der instrumentale Voor- en Naspelen in den dirigent van koor en orkest een verwanten geest vonden. — Mengelberg maakte Diepenbrock's kunst tot muziek waarvoor hij zich geven wilde, geestdriftig. Zoo kon er iets zeldzaams ontstaan! Zoo huldigen wij, met den componist, hèm van harte die de feestdirecteur is van het thans recht feestelijk ingewijd Nederlandsch Muziekfeest.